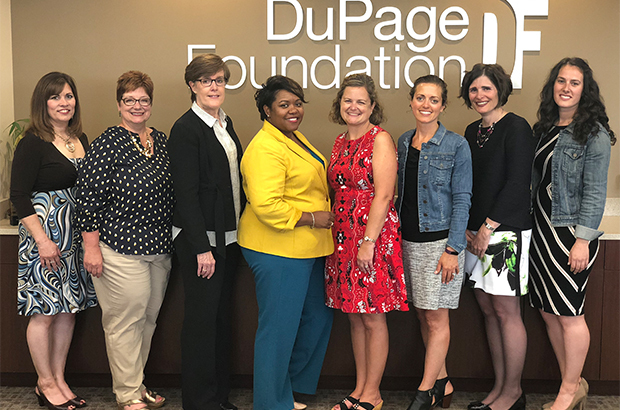 Bright & Early DuPage recently awarded $335,000 to support the work of six local early childhood collaboratives and the DuPage County Early Childhood Collaboration (DECC). One goal of these grants is to help build systems that increase the number of children who are ready to succeed when they enter kindergarten. But what does this really mean? DECC Program Director FaKelia Guyton explains. Q. What is early childhood? A. It’s a period of human development from prenatal through eight years old. Approximately 85% of brain development occurs during this time, so it’s critical that children receive high-quality childcare focused on social/emotional, language/communication, motor/physical, cognitive, and learning approaches during that time. Q. How is “kindergarten readiness” defined? A. We use the READY Child equation. Ready Families + Ready Health + READY Early Care and Education + Ready Schools + Ready Communities = Children who are prepared to succeed in kindergarten and the future. There are a lot of variables, which is why representation from different areas is so important. Q. What are early childhood collaborations? A. They bring together individuals, community stakeholders, families, and organizations to address and solve shared challenges in the early childhood care and education space that cannot be resolved alone. We actively work to ensure we’re not duplicating services. Collaborations work at the local level to help families navigate unknown services, provide vital coordination between a complicated web of providers, and serve as a feedback loop between communities and state agencies. Q. How do collaborations expand the reach of an individual entity? A. Historically, private and public funders focused on programmatic solutions with an isolated impact. However, today’s children and families with high needs are experiencing multiple barriers with complex and intertwined root causes. Complex problems require more than a programmatic approach; they require community systems-building strategies for collective impact. This is especially critical to at-risk families who are already under-resourced. Q. How are collaborations increasing the number of children who are ready for kindergarten? A. Many collaborations are working on systemic strategies, such as building enrollment pipelines and creating continuous services from prenatal through school-age years. When childcare providers, schools, libraries, local businesses, healthcare clinics, and organizations come together, we can meet at-risk families where they are and expand their network of trusted professionals. This results in more relationships between agencies, more developmental screenings, more low-income children enrolled in the limited publically-funded preschool seats, more library cards issued, etc. Q. I’m an early childhood care provider interested in coordinating my efforts with others. What can I do? A. I’m happy to connect you with your community’s local collaboration. Contact me at fakelia.guyton@ywcachicago.org or 630.580.3125.